What happens when a major TV star asks his viewers to Tweet their worst dating experience? Twitter is flooded with funny and bittersweet messages that we can’t stop reading. People’s stories are so hilarious and surprising they are bound to bring a smile to your face. Enjoy. Famous presented Jimmy Fallon asked his fans to write about their worst date and started the thread by sharing his own. Jimmy Fallon shares his own worst dating experience. For some of his viewers, there are practical issues spoiling their dates. Amy DeCamp, for instance, found there was something worse than meeting her guy’s parents. Meeting his uncle – who just happened to be hers too. Similarly, user @timdrake almost dated his cousin. Then, there are awkward situations that people faced in their own unique way- some running away and others making the most of them. Act my age was confronted with one of the worst dating fears there is: that awkward silence. And he lasted 10 whole minutes. User @TheMotherboard had a lovely pancakes and revelations breakfast. A truly memorable worst dating experience, no doubt. BrentDavidSchroeder just went with the flow and enjoyed a 2-hour Xbox game with his date’s son on his (supposed) date. Megan Clemmer found her date a little too brutally honest, but also weirdly sensitive about his own feelings too. One of the funniest tweets is Weird Desi‘s, who literally went on a date with “the wrong person”. Poor Heather Ellyson went out with a guy who can’t really be described as “a catch”. Prison time? Tick. Can’t over an ex? Tick. Rotten teeth? Check. 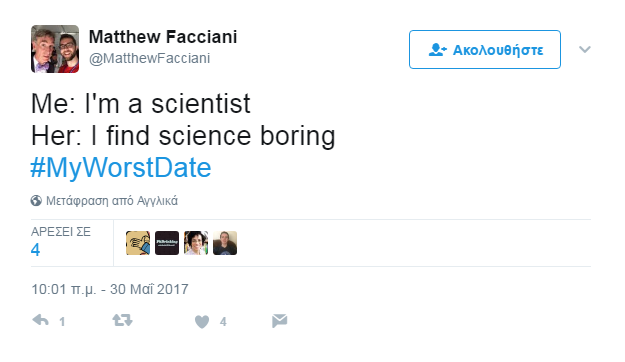 But there are cases when your date is simply doomed to fail. For instance, this one. Twitter user Stephanie McBain really can’t blame herself for this date gone wrong. And then, there’s this instance, where your date has a truly legit reason for not showing up at all. User @_MsMinaP‘s date was so bad, it didn’t even begin in the first place. At least he had a good excuse. When we are in the eye of the dating storm, we may be too involved to see the funny side of our dating failures, but reading about other people’s worst dating experience never fails to make us laugh and see things from a different perspective.